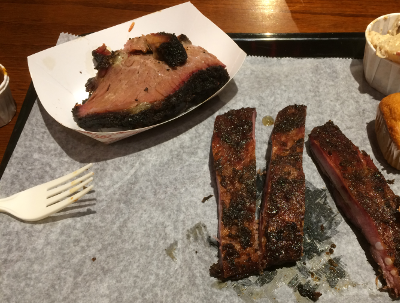 As my quest for the best BBQ in New England continues, I checked out a BBQ joint in Sturbridge, MA that came highly recommended: BTs Smokehouse. I had the opportunity to check this place out twice; once for dinner, and once for lunch. The dinner, for whatever reason, was significantly better. The meat I had for lunch tasted like it had been reheated either too long, or more than once; it was very dry and hard. I had brisket and pulled pork and then brisket and ribs (I'm a brisket lover at heart). Their BBQ is definitely some of the best I've had in New England. I'm partial to my own of course, but this place is really worth a trip. Their brisket looks like it was smoked! Most places out here cut off the bark/crust that the meat gets when it smokes, but not BTs! Their sauces are also pretty good. They are a little on the watery side, but have a good flavor, very reminiscent of the Salt Lick out in central Texas. The ribs and pulled pork were good, but heavily shadowed by the brisket. I'd stick to just the brisket next time I come. Give it a try if you're ever out in the area!